Five years ago, the then CEO of Wendy’s International issued a directive that “when the QSR (Quick-Service Restaurant) industry went all digital, we needed to be ready with a fully scalable, operational, supportable solution for the entire brand,” remembers Nick DeCarlo, Director, Restaurant Solutions at Wendy’s. 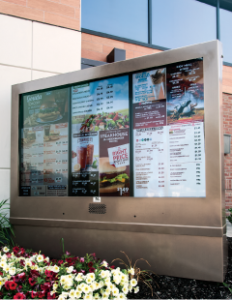 Today, Wendy’s has approximately 2,500 media players running digital menu boards powered by Scala software in many of its nearly 6,500 North American corporate and franchise restaurants. Other key benefits to working with Scala has been Scala Designer, which enables Wendy’s information technology team to upload custom designed and optimized content to individual restaurants—all with a small footprint. “Our slogan is ‘quality is our recipe’ and we want that to apply to everything we do,” DeCarlo says, and that means offering the highest-quality solution they could to show their food in the best possible light. Now that the hard work of finding hardware and software that meets their needs is behind them, “it’s time for the fun stuff,” DeCarlo says. This means experimenting with digital menu boards at drive-through windows, which comprises 65% of Wendy’s business and has been test marketed in Boston, Columbus and Phoenix. In some instances, like Phoenix, weather proved to be a challenge technically and financially. “It just required too much air conditioning and electricity to keep the units cool to be cost beneficial,” DeCarlo says. More successful test programs have been queuing menu boards via Twitter, which was especially popular with teenagers. “We’re curious to see how that affects retention and how we can use it for loyalty programs,” DeCarlo says. Wendy’s is also looking into using Scala software for mobile app integration as well as limited time offers and feature items.